If you have a diesel pickup truck with a stick shift, and it runs over 450 RWHP or so, you’ve probably heard quite a bit about double disc conversions (aka twin disc conversions). The commonly held belief is that double disc clutches are necessary once power levels exceed "X" amount of torque or horsepower. 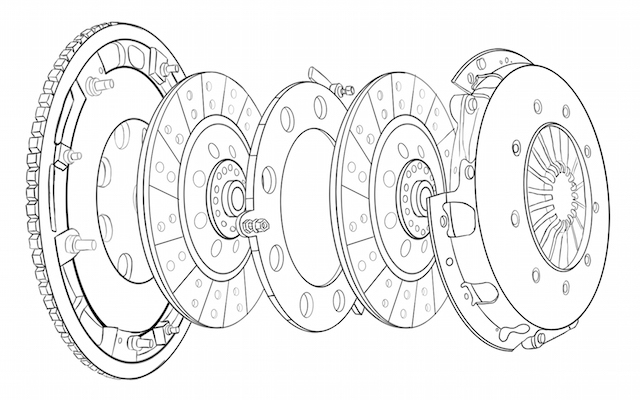 Indeed, according to many companies that sell double disc clutch kits, vehicles that exceed some arbitrary horsepower rating must be equipped with a double-disc clutch. As self-serving as these recommendations are, they've become part of the conventional wisdom...and we want to set the record straight. Here's what you need to know about double disc clutches, and why Phoenix Friction doesn't sell these types of kits. 1. They handle extreme applications. It's going to depend on the vehicle, but there are some situations where a double disc is the only option. If you have a very high horsepower/torque truck (800+ hp), double disc is your only option as single disc clutches will burn out over 700hp. 2. They sound like they're really tough. Two is better than one, right? So a "double" disc is better than a "single" disc, especially if the person you're describing your clutch to doesn't know much about the system. 1. Most of the double disc systems are hard to drive. After the break-in period, double disc clutches become only slightly more drivable than they were before. Simply stated, double disc setups don't allow for feathering. Either the clutch is engaged fully or it's not engaged at all. Smooth take-offs from a stoplight? Nearly impossible. Stop and go? Towing in reverse? Be ready to hate driving. 2. When you double the clutch discs, you double the price! For the most part, double clutch kits are far more expensive than single disc kits. Without calling out anyone in particular, it's no surprise that a lot of clutch retailers recommend double disc setups...why sell someone one clutch when you can sell two? 3. Single disc clutches can handle considerable torque. Phoenix Friction has been selling single clutch discs to fleets and large commercial operators for decades, most of which operate light duty diesel trucks (like the Ram HD series, Ford Super Duty, etc) and medium duty trucks (like the larger 4500 and 5500 Ram or F450 thru F750). We don't usually recommend double disc clutches because there's a lot you can do with a single disc and the right friction material(s). 4. Single discs are infinitely more drivable than double discs. Single disc setups allow for smooth takeoffs, minimal pedal effort, and make stop-and-go driving tolerable. When we talk about clutch design and wear and tear, it's important to understand that it's all about the friction material. The right friction material will be able to "grab" without getting too hot, as high temperatures lead to excessive wear. Detailed specifications of the friction material itself, which can only be determined thru simple Chase Machine tests, more complex certified friction material lab dynamic tests and on-vehicle tests. It's not enough to know the coefficient of static friction. We need to know how that coefficient changes at various temperatures, how quickly the material heats up and cools down, etc. A precise understanding of the clutch system design. How big is the disc? How much pressure does the pressure plate provide? What are the common failure modes? What is the design of the release bearing, and how will that impact the maximum pressure a pressure plate can have without making the pedal effort to release the clutch too high and uncomfortable, etc. Experience in clutch system design and manufacturing. Even if you have all the friction material specs and clutch system design information, experience is important. A competent clutch manufacturer knows how to select a material that gives the end user the right "feel" in addition to be durable. Testing, both in the field and on the bench. Field testing is by far the best way to determine if all the clutch specifications are correct. A clutch is fabricated, installed, and then monitored over the course of thousands of miles. If the design was correct, the clutch will perform as promised. If not, it's back to step 1. To be blunt, designing a good, reliable clutch is hard. We know it's hard because we see how much time and effort is put in by both the clutch manufacturers and the car manufacturers to find the perfection clutch design for an OE vehicle as it is designed. Once a vehicle is modified in the field, it takes a reputable company with deep design and testing resources to develop a dependable and reliable clutch that will function correctly at different horsepower levels (and in different environments). Considering how much time and resources it takes to develop a trouble-free single plate clutch for modified applications, it's no wonder that a lot of aftermarket companies recommend double disk clutch systems for heavy duty applications. However, Phoenix Friction has been in the commercial clutch business for decades. Most of our experience is designing heavy duty clutch systems for use on commercial vehicles that are used for deliveries and heavy hauling. We know what we're doing. And in all the years that we've been building clutches, we’ve found that single plate clutches give the best performance and reliability when they are within the designed torque range. Do You Need A Double Disc Conversion Kit? Our best advice to anyone with a heavy duty diesel pickup truck (even one that's been modified or that's used for heavy hauling or towing on a daily basis): Don't buy a double disc clutch. They are expensive, almost always unnecessary, and most people hate driving vehicles that have them. Instead, we suggest you invest in a good quality single disc clutch. Just be sure to choose one that's rated for your specific vehicle's power level. If you have any questions are what the right product is for your application is, please contact us by phone, chat, or email with the modifications you have made and how the vehicle is being used, and we will gladly provide you with the proper guidance.